To Mr. Gabriel Sydenham : The directions to the new dealership are almost the same, we are just 5 minutes away from the old location. 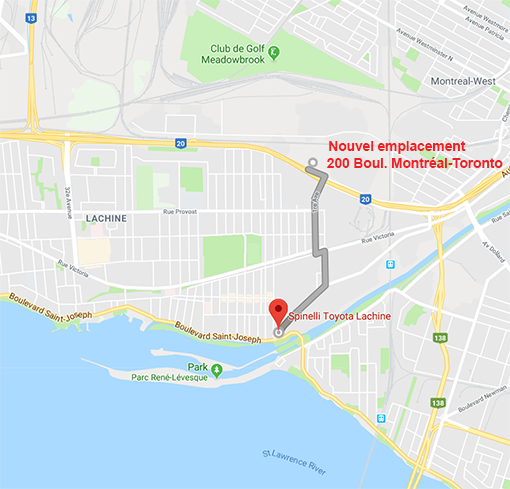 Still exit at "1re avenue", you should see the dealership from the the "1re avenue" intersection, then take boulevard Montreal-Toronto instead of the exit ramp for highway 20. Pour M. Yvon Lavoie, les heures de service n'ont pas changées, le service de navette est toujours disponible pour vous raccompagner. For English, press the "EN" at the top right corner of the website. How do I get there from NDG? Do I have to taken rte 20? I would appreciate some English here. I wonder if you have this available in English? That would be helpful. Thank you.